How can I send a test email? How do you make sure your campaign is perfect and ready to be launched? Simply send a test email and see what your campaign will look like. Click on the campaign to open the Campaign details page. Hover over a template on any step and click Edit. 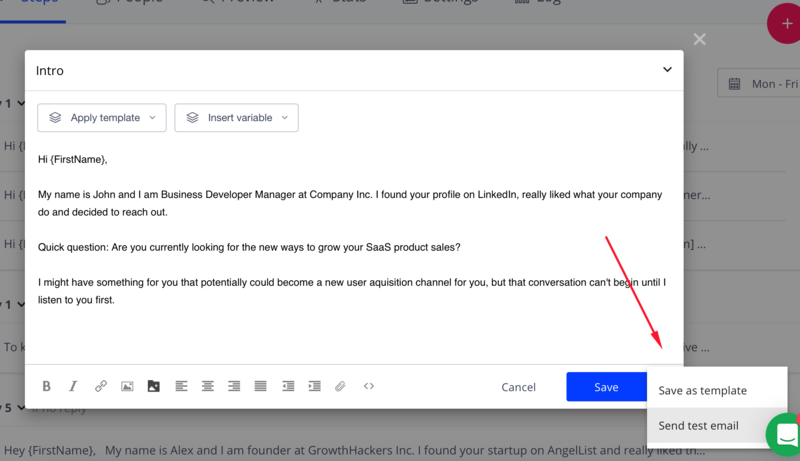 In the Template edit window, expand the drop down list near the Save button and click Send test email. In the Send test email window, click Send to send a test email to the prepopulated email address or type the new one and click Send. Note: if there are no prospects in the campaign, you will receive the test email with not populated variables from the template.